There is a small butterfly-shaped gland located at the base of your neck. That little gland is considered the most important hormone gland in your body, and it would be very difficult for other hormone glands to function without it. It is the control center responsible for metabolic function of every cell in your body. What is it? It’s your thyroid gland. Knowing this, it likely comes as no shock that having a healthy thyroid is important to your overall health. Unfortunately, knowing when your thyroid isn’t performing to the best of its abilities can be difficult. Here’s what you need to know to diagnose and treat hypothyroidism before it wreaks too much havoc on your overall health. When the thyroid does not produce enough thyroid hormone, every part of your body will pay the price. In fact, you may be familiar with some of the major symptoms. Do any of these statements describe you? You continue to gain weight without much of an appetite. You’re constantly tired, but you can’t sleep. You are easily depressed and irritable. Your joints and muscles always ache. You feel cold all the time (even in the heat). I think you can agree that this doesn’t sound like a healthy person. But the sad and unfortunate reality is that your doctor could easily miss a diagnosis of hypothyroidism. Say you suspect you may have a thyroid problem, and your doctor gives you the thyroid stimulating hormone (TSH) blood test. (This test indicates hypothyroidism when thyroid hormone levels are low, and TSH levels are high. The pituitary gland is sometimes the problem when thyroid hormone and TSH levels are both low.) Your blood test reveals the normal range—between 0.5 and 4.5 mIU/L (milli-international units per liter). You are healthy then, right? Not so fast. Hypothyroidism is one of those tricky conditions that can be hard to detect with a simple blood test. Do You Have Hypothyroidism 1 or 2? Dr. Mark Starr is considered a leading hormonal health expert and is the author of Type 2 Hypothyroidism: The Epidemic. Wait, what? There’s a type 2 hypothyroidism, and it’s an epidemic? It’s true. According to Dr. Starr, type 1 hypothyroidism is considered when the thyroid gland does not produce sufficient thyroid hormones for “normal” blood levels. The pituitary gland also fails to produce “normal” TSH blood levels. The TSH blood test will only diagnose two to five percent of hypothyroidism patients. So what about type 2 hypothyroidism? Things are a little more complicated when it comes to type 2 hypothyroidism as a lack of thyroid hormone is not the issue. In fact, TSH blood tests often reveal normal amounts of TSH and thyroid hormones. Type 2 hypothyroidism is often an inherited condition, and there isn’t a blood test that will detect it. So, what is the solution? It may be time to consider a holistic or naturopathic doctor. They will review the patient’s personal and family medical history. 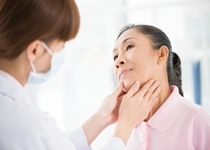 A saliva test or comprehensive blood thyroid panel may also help uncover your type 2 hypothyroidism. A basal body temperature test is also considered a very effective method for type 2 hypothyroidism diagnostics. It is a simple test that you can even perform in the comfort of your home. In the morning, place a digital thermometer under you armpit, and hold it firmly there for 10 minutes while laying perfectly still; the thermometer reading may be altered from the slightest movement. After 10 minutes have passed, record your reading. Repeat this procedure for three days, then review your average reading. It is an indication of hypothyroidism when the average reading ranges between 97.07 and 98.2 degrees Fahrenheit. It is estimated that 40% of North Americans suffer from type 2 hypothyroidism when the basal body temperature test is considered. A history of cancer, especially thyroid or endocrine cancers, can indicate type 2 hypothyroidism as well. Finally, the myxedema skin pinch test can also help your doctor diagnose your hypothyroidism. Simply put, you want to be able to pinch the skin on your arm or other areas of your body. Thickened and swelling skin is another major symptom of hypothyroidism. Synthetic thyroid hormones, or T4 (levothyroxine), is considered the conventional hypothyroidism treatment. However, many people on this treatment still experience hypothyroidism symptoms. Desiccated thyroid is also sometimes used, but both medications are considered ineffective when adrenal fatigue is the root cause of the problem. Adrenal fatigue and hypothyroidism should be treated simultaneously. A natural approach to thyroid and adrenal support should include tyrosine, iodine, selenium, zinc, and vitamins A, C, B2, B6, B12, D, and E. Also, a thyroid glandular supplement will help stimulate thyroid function. Natural food sources for boosting thyroid health include sea vegetables such as nori, kelp, kombu, and wakame, which are high in iodine and recommended for people with hypothyroidism. It is also wise to eliminate or at least reduce your exposure to possible hormone disruptors, including synthetic estrogen, heavy metals, halogens, and chemicals. Murray, M., et al., The Encyclopedia of Natural Medicine (New York: Atria Paperback, 2012), 716–722. Nutritional Symptomatology Level II (Toronto: Institute of Holistic Nutrition course notes, 2014), 180–186. Trentini, D., “300+ Hypothyroidism Symptoms…Yes REALLY,” HypothyroidMom web site, November 19, 2012; http://hypothyroidmom.com/300-hypothyroidism-symptoms-yes-really/, last accessed March 4, 2015. Balch, J., et al., Prescription for Natural Cures: A Self-Care Guide for Treating Health Problems with Natural Remedies Including Diet, Nutrition, Supplements, and Other Holistic Methods (Hoboken: John Wiley & Sons, Inc., 2004), 340–345. Starr, M., Hypothyroidism Type 2: The Epidemic (Columbia: Mark Starr Trust, 2005), 1, 24–25, 52–53.